Norwalk Board of Education Chairman Mike Barbis, Tuesday in City Hall. NORWALK, Conn. – Multiple Norwalk Dems on Thursday blasted fellow Democrat and Board of Ed Chair Mike Barbis for urging board members not to attend an NAACP fundraiser. Mayor Harry Rilling called Barbis’s move “very disturbing” and State Senate Majority Leader Bob Duff (D-25) described it as part of a “less than sensitive” pattern. Norwalk Branch NAACP President Brenda Penn-Williams said many people have reached out to her to say that Barbis should step down. Barbis on Oct. 5 sent an email to fellow Board members urging them not to attend the 18th annual NAACP Freedom Fund banquet, a fundraiser for school scholarships, on Oct. 19. “Considering the leadership at the local NAACP chapter and their history of making very serious false allegations and attacks on the BOE and our staff, I would urge all board members to not attend the chapter’s dinner event this year,” Barbis wrote in the email, obtained by NancyOnNorwalk through a Freedom of Information Act request and published Wednesday. “The actions of Mr. Barbis and some members of the Norwalk Board of Education are not an isolated incident, but part of a pattern of behavior that mistreats and diminishes the African-American community in Norwalk. The fact that this was only revealed through a Freedom of Information request, since it was allegedly originally denied by Mr. Barbis, is deeply troubling. Mr. Barbis is Chair of a Board of Education which is responsible for setting policy for an ethnically diverse school district. Despite this fact, Mr. Barbis continues to be less than sensitive to Norwalk’s minority students, parents, teachers, administrators and community leaders. The history of unduly singling out leaders of this community continues and needs to stop. Barbis did not respond to an email from NancyOnNorwalk asking for a response to the comments. Barbis routinely slams Duff during his public commentary. He has called the $5 million in capital budget funds reallocated to renovate Norwalk High School the “Duff bribe” and, on Tuesday, suggested a parent contact Duff about the Norwalk High bathroom shortage. Duff is a member of the NHS School Governance Council. NoN cannot recall Duff ever saying something similarly negative about Barbis. Duff has proposed legislation that would give the chief elected official of a community that spends more than half its budget on education the right to select the Board of Education Chairman. This would apply to Norwalk; Mayor Harry Rilling said he did not request Duff propose the bill. Duff recently said nothing in Norwalk has inspired the legislation but said Mayors are held accountable for education outcomes but have no say in how a BoE is run and forms its budgets. “I recently became aware of this and found it very disturbing. I am an ex-officio member of the BOE but was not copied on Mr. Barbis’ e-mail. “The Freedom Fund Banquet is a celebration of the good work of the organization and the people who make Norwalk the great city it is. The event raises scholarship money for students in our community. The NAACP is an organization that gives a voice and hope to so many. “The Board of Education is charged with providing the best possible education for our children. The goal and mission of the two organizations are the same. “It was inappropriate for Mr. Barbis to encourage the members of the BOE to boycott the NAACP Freedom Fund Banquet. If he opted not to attend, that was his prerogative. Penn-Williams said half the people who have contacted her are Caucasian. Board of Education members were notified in an Oct. 4 email from an executive assistant that NPS was not buying a table at the event, “per” Norwalk Superintendent of Schools Steven Adamowski. The assistant offered to purchase individual tickets. Barbara Meyer-Mitchell was the only Board member to attend. No administrators did. Penn-Williams and Barbis got into an argument at the Sept. 25 BoE meeting when she charged that the elimination of Brigg High School was already a disaster. Barbis’ comment was inappropriate, and if NPS feels Roberts isn’t up to snuff, they should work with him, give him support, she said. “When you become a leader, you become like a vigilante, like you can do whatever you want to do,” she said, of Barbis. She added that Board members are supposed to be policy setters and not get into the day-to-day operations of the school district. NPS has “gone after” African American administrators, Penn-Williams charged, naming then-West Rocks Middle School Principal Lynne Moore, then-Human Relations Officer Bruce Morris and then-Norwalk Pathways Academy at Briggs Principal Marie Allen, and “I hear they are going after Reginald Roberts now,” she said. Board members did not respond to an email from NancyOnNorwalk asking for a response to Penn-Williams’ comments. “Sadly Mr. Barbis told others not to attend the NAACP Freedom Fund Banquet this year. Well, a Norman Rockwell painting Norwalk isn’t. Mayor Rilling has “found his voice”. But remained silent when 3 Democrat BOE members accused the entire Norwalk BOE of “discrimination” supported by the NAACP without ever producing supporting evidence greatly embarrassing Norwalk. Perhaps we have a better understanding of Sen. Duff’s bill to allow Mayors to determine BOE Chairs. Our BOE remains Norwalk’s sole “bright spot” in City governance. In contrast to the $150k “Chiefs” at City Hall supposedly making Norwalk “more efficient”. Lets encourage Mayor Rilling to explain why the City’s Grand List remains constant for a nentire decade, punitive property taxes encouraging a major exodus of long time homeowners, why we have falling property values (down 10% last year), a City attractive to renters (40% up from 30%) rather than homeowners and the great reluctance of major business to bring good jobs to Norwalk. Mayor Rilling hasn’t taken much interest in the BOE or attending meetings heretofor. Is the new concern related to upcoming Mayoral election ? Perhaps an effort to secure new leadership for the BOE ? 1.) Brenda Penn Williams has personally been going after Mike Barbis since he supported Ed Camacho for Chair of the DTC over her. Personal vendettas are so ugly! 2.) After everything that BPW, Bruce Morris and John Mosby has done to the BOE and superintendents through the years – who wants to support them. This has nothing to do with race but toxic people like BPW, JM and BM who have been using race for years to bully their way to get things done. It is not right. I was not born with a silver spoon in my mouth and she has treated me that way for years. Her quote reflects how she thinks this way. This is wrong. 3.) Bob Duff needs to focus on Hartford. It is a mess. How many years has he been up there? 10 or 12? He was the one who created the animosity among the BOE and the parents when he tried to jam his Fix it First program at us. One thing I have learned about Bob is that he won’t say anything out loud or to your face, but he will work hard to undermine or manipulate things behind your back. I have always preferred the honest and direct way myself. If he had truly been a bigger person, he would have stated he made a mistake (something I have never heard come out of his mouth) and moved on and tried to work with Dr. Adamowski and the BOE. 4.) NAACP should elect a new president and Brenda Penn-Williams should step down. She is using this position as her own bully pulpit. I personally don’t think she is fit to be President of this organization. 5.) Mike Barbis has fought hard for new schools for the lower income communities, English learning programs and he has worked hard to focus on young African American men that were falling through the cracks and not being educated in the Norwalk School System. He has been active for years for the Carver Center and raising money for all sorts of inner-city projects. So, Bob Duff’s statement is inaccurate. I also am thankful as a parent for all that Mike Barbis, Heidi Keyes and Mike Lyon have done through the past 8 to 10 years to really turn Norwalk Schools around. 6.) Bob Duff’s comment about unduly singling out leaders needs to stop…I don’t agree with that. It is called Freedom of Speech. When someone is not doing their job – call them out on it! I am sure now he will do something behind the scenes to try in hurt me. But I believe in Freedom of Speech. I wish he was focused on the financial failure of the State of Connecticut and focused on reducing our taxes, the same way he is on trying to run Norwalk. I hate to tell you this, but Norwalk is doing much better than the State of Connecticut is. Perhaps Norwalk’s leadership, active volunteers and parents should go up to Hartford and show them how it is done.! John Levin! I just spit out my coffee! Funny!!! Well put, Nora King. Agree with every word. Number five highlights how hard Mr. Barbis fights for all, not just for some, as Mrs. Penn-Williams accuses. Of strong conviction he appears to be (and what is wrong with that personality trait in a leader? ), but racist he absolutely is not. However, Mrs. Penn-Williams’ accusations of Mr. Barbis in this piece are highly racially charged and discriminatory. Mr. Barbis and this BoE have made great strides in improving Norwalk’s schools, for which so many of us are highly grateful. Unfortunately, we remember all too well how things were (not) going before this crew came on board and provided real data, structure, a plan of action with measurable results, ACCOUNTABILITY, etc. That Mayor Rilling (who doesn’t even engage In BoE meetings, which is glaring to Norwalk residents) and Senator Duff (A NHS SGC member who cannot figure out with Principal Reynolds and fellow SGC members how to hire a competent janitorial crew, clean/open/monitor/create a tight bathroom block schedule for the filth-ridden bathrooms, and keep the vaping kids from running the high school?) are hastily piling onto Mr. Barbis with Mrs. Penn-Williams, who accused Mr. Barbis of racism but ironically just hurled a bunch of racist remarks at him, makes it all the more obvious to me that all three of these individuals personally have it out for Mr. Barbis. As far as the accusation that Mr. Roberts is being targeted because he is African America, Mrs. Penn-Williams is way off here. Mr. Reynolds has no control over that high school. It is disgraceful what is going on in that school. And it is beyond bizarre that Senator Duff is on that SGC and is doing nothing about the disgrace in any urgent way. Mr. Reynolds is not doing his job, period. I agree with Mr. Barbis. Stop making this a race issue, Mrs. Penn-Williams. Poor performance of principals is poor performance, and it hurts our children. Poorly performing principals, African American, White or otherwise, don’t get a pass because they are of a certain skin color or race. Enough already. What a sad day for Norwalk – a deeply troubled City beset by a stagnant Grand List for an entire decade, falling property values, outflow of long time residents, punitive taxes so high even well paid City employees avoid living here. Just years after the highly embarrassingunfounded discrimination charges we have our City’s 2 most important elected officials attacking our highly respected BOE. What’s going on here ? Mayor Rilling concerned about his re-election ? Now our “Education Mayor” ? Since his initial election Mayor Rilling has rarely spoken about the City’s myriad major issues. Imagine the damage to our City’s reputation when its Mayor challenges its well received BOE. No wonder well qualified citizens avoid “public service” in Norwalk. Is the Legacy the Mayor wants to leave ? One thing that never changes -who ever sits in the chairman’s seat has a HUGE target on their back. I agree with all the comments thus far, especially Nora’s. There’s so much back stabbing and/or political subtlety that goes on behind the scenes that most people don’t know about. Yes, BOE should be supportive of NAACP awards. However, this local chapter doesn’t make it easy to work with them. Duff should focus his energies in Hartford and stop using his Hartford power to benefit himself and/or his party in Norwalk. There are a lot of people in town, and surrounding towns, that are seeing right through his political game play. And next time everyone goes to the ballots, remember this is what single party rule looks like. It is troubling when Hartford proposes legislation that directly interferes with the municipally chartered operations without a clear objective. There shall be in said city a Department of Education which shall be under the control of nine members, who shall be electors of the City of Norwalk, and shall be known as the Board of Education. Its members shall be elected as hereinbefore provided. Said Board shall hold a regular meeting each month. The Mayor of said city shall be, ex officio, Chairman of said Board of Education and shall preside at all meetings of said Board. He shall have no vote in any meeting of said Board except in case of a tie vote among the regular members of said Board. Said Board shall, at its first meeting and annually thereafter, elect from its number a Chairman pro tempore, who shall preside at all meetings of said Board in the absence of the Mayor. My preference is not to have the Mayor further delegate his own responsibilities under the charter to any hand-chosen individuals. With a new Chief of Staff and reorganization to reduce his span of control, he should have the time to attend BOE meetings to maintain a hands-on and TRANSPARENT connection with the Board. Perhaps, there would have been fewer opportunities for these kinds of toxic interactions to take place among board members if the Mayor’s tempering influence had been in the room. This is something that could have been proposed under charter revision several years ago, had it been a priority. Nora King — Congrats and well said. Although I do think Mike could’ve been a little smarter in his approach. That’s odd, as that is what many have asked you to do in regards to your same old same old fact less statements. Maybe its time to practice what you preach. Also you claim time and again that the BOA is highly respected . The thing you need to keep in mind is that you seem to be one of the very few that feels that way. If Senator Duff was truly supportive of the Norwalk African-American community, he would fight was our fair share of state funding instead of placating his majority caucus in exchange for a leadership position. I wish Senator Duff was as good a legislator working for our community as he is a politician masterfully adding fuel to the fire and pitting people against each other to detract from his inability to perform. This behavior is disgusting and HE should resign! who is the puppet and who is the master,duff or rilling???? We, as the Board of the NAACP, were surprised by your email, dated Friday October 5, 2018 to Board of Education members, suggesting that Board of Education members and staff not attend the NAACP’s annual Freedom Fund Gala. Your letter is unfortunate on many levels, especially since all the proceeds of the event provide scholarships to students from Norwalk Public Schools. This event is attended by both national and state congresspeople, city officials, and leaders in education and industry, as well as “ordinary” citizens who prize the kindness, unity, diversity, common sense and comradeship that are intrinsic to this event. It would seem, from your email and recent actions against our president and against our choice of award recipients, that your pettiness, arrogance and capricious style of communication resulted in a bullying and, perhaps threatening, instruction to good people who may fear you enough to kowtow to the implicit instructions within your email. This behavior on your part is clearly in line with the unfair treatment given to a trio of black and brown former members of the Board of Ed, as evidenced by court documents available at https://www.nancyonnorwalk.com/wp-content/uploads/2017/11/Lyons-depostion-first-mention-no-emails-to-Trio.pdf and https://www.nancyonnorwalk.com/wp-content/uploads/2017/11/Lyons-depostion-second-mention-no-emails-to-Trio.pdf . Your denial of the unfair and unprofessional treatment of former members of the Board of Ed and false accusations that you made public may indeed give you some responsibility for the lack of diversity on the Board today. You refer to the Greater Norwalk Chapter of the NAACP as “unstoried”. By definition, “unstoried” means that our chapter isn’t interesting… that we don’t have an interesting story. Happily, there are hundreds of Norwalk citizens, black, brown and white, who have benefitted from gains in fair housing, courtroom procedure, civil justice, criminal justice and educational advocacy that were facilitated by our “unstoried” branch. We are in fact, “storied” by our involvement within the community that we serve. Our “unstoried” chapter has included many local heroes, as have our leaders and members over the past many years. It is striking that you invoke the names of Medgar Evers, Roy Wilkins and Thurgood Marshall. You undermine so much of what they fought for and, in Medgar Evers’ case, died for. Your failure to acknowledge unfairnesses spotlighted by the NAACP, failure to take responsibility for their improvement, and your pomposity in blaming and punishing people who simply have a different point of view is not only contrary to the teachings of those you so carelessly mention, but contrary to the qualities of an educational leader, and potential role model, such as the chairperson of the Board of Ed should be. As mentioned above, the NAACP Freedom Fund Banquet is not a forum for cheap politicking; it is a celebration of diversity and the accomplishments of our friends and neighbors. We hope that you find your way to join us next fall. 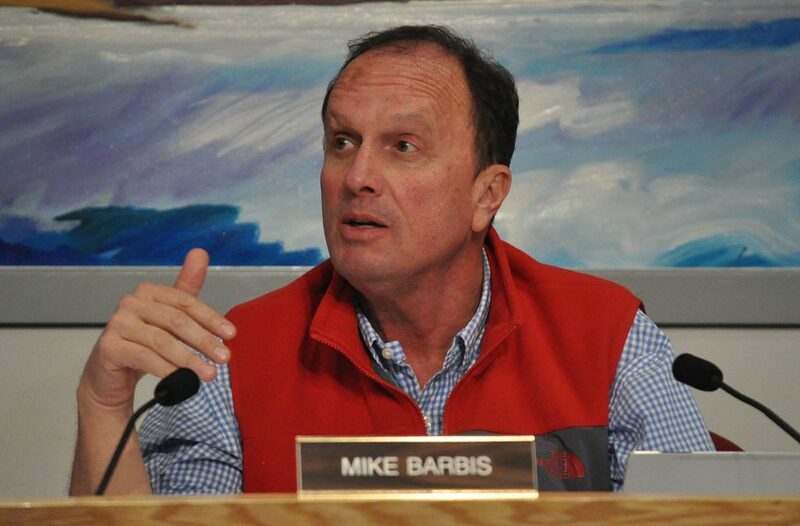 While at times in disagreement with the BOE, I support Mike Barbis and the independence of BOE. They are professional and passionate about their work . . . as a senior senator, Duff needs to focus on returning deserved tax payer dollars back to this city and not more wealth distribution/tax schemes to the inner cities. Connecticut is on a fast track to ruin and we should expect more from our legislators. Eric- the BOE is voted on by Norwalk residents. Blaming the chair for people not being on the board is ludicrous. They got voted out of office. Why does Norwalk only get 5 cents back from the state for every tax dollar generated for the state from Norwalk economic activity? Why are other, more wealthy towns, getting more money for legally mandated services? Who is responsible for this? Can anyone answer these questions? These are the real questions. Questions about why unpaid volunteer board members can’t or don’t attend the 100s upon 100s of events we are invited to are worthy, but ignores the cause of our real issues. For the undetermined, please stay focused. Supporting a school system with 2/3rds minority children and no support from the state is hard enough, we don’t need to eat our own like some want us to. @Nora King, great summary, I agree with everything you wrote. Norwalk has been blessed with a highly competent (and human) BOE and a strong Superintendent for a while now. Everyone seems to have forgotten the shxxshow it used to be. I also find it ironic that Duff, a politician who gets highly paid for his time, even though incapable of bringing home the bacon for Norwalk, is so quick to question the motives, temperaments and communication skills of hard-working BOE volunteers. @Nora Your comments are 100% Spot on! And to add Mike Barbis along with most of the other BOE Members have one thing in mind and how can we make our schools better for all the kids. It’s not an easy job in the least. But he and the other board members continue to fight for every nickel, penny and dime for our schools. I am Glad Barbis he leads this group and is in the position he is in. @NON, the BOE knows you always do FOIA requests. Barbis wrote his email to all 9 members of the BOE. Barbis didn’t want to engage with NON, that’s all this sounds like to me. Any way that NON can look into Duff’s new Senate bill, the one allowing a Mayor to appoint the BOE Chair, with the same vigor as you reported on Barbis? Duff’s bill sure looks like it’s about Norwalk despite his protestations otherwise. Duff told NON that he ‘discussed this on a statewide level’ for the last 2 years, but then Rilling told NON that Duff hadn’t spoken to him, Norwalk’s Mayor, about it? Rilling has since told NON that ‘he did not request Duff propose the bill.’ So which is it? These comments by Duff and Rilling do not pass the smell test. Hey Bob Duff how about doing something about the taxes that the Dems have instore for us instead this petty garbage going on here !!!! Putting the BOE in the hands of the Mayor would be moving back to the 1700s and King George. Incredibly stupid idea. I’m glad Mike Barbis is working for all the students of Norwalk and not just Senator Duff’s cronies. Implied in these comments is that the Board of Ed has purchased full tables at the NAACP’s charitable banquet. If that is the case, who authorized the use of taxpayer funds for employees to attend a charitable banquet? We work very hard to pay our ever-increasing taxes in Norwalk, and I have nothing but respect for those who volunteer to lead our BOE, but I am very disturbed that BOE funds have been spent in this way. I would expect BOE members and staff to pay their own way.